Buying a podcast package will help cover all of the grounds we need to get going on our latest creative endeavors. Podcasting gear in general can start to add up and get costly, which was why we were inspired to get a guide going on certain ‘packages’ and ‘bundles’ that include a variety of equipment you need to start a podcast, or perhaps upgrade your current setup with better gear. 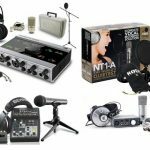 Although some may consider some of these recording studio bundles, we think they crossover to one another since technically “recording vocals” isn’t just limited to singers or musicians. At the same time, having some high-quality studio gear that’s optimal for sound quality and work flow will only help the effectiveness of our podcasts and make us really stand out from the rest. Microphone: Of course, we can’t record anything without the proper device to do so. The microphone is an obvious staple-point of podcasting, and today all of the packages we found include a mic. When readers ask us what the best microphone for podcasting is, we typically recommend either a USB microphone (none of the bundles in here include one, but they’re still effective) or more popularly, a studio condenser mic. 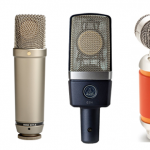 As stated previously, a lot of these are “studio packages”, so you’ll be getting a great quality condenser microphone. Condenser mics are ideal for recording vocals, which is of course our intended use with podcasts (although you don’t have to sing, unless you’d like to , be our guest). These typically hook up using an XLR port. You then plug this XLR cable into a device to “power it up”, also known as “phantom power” (just another name for a power device, since condenser microphones don’t have enough power on their own without one). Which then leads us to our next bullet point. Interface\Mixer: As previously stated, we need the proper device to power up our condenser microphone. The most popular solution here is an audio interface, which provides not only phantom power to make our condenser mics work, but also include some more ins and outs, such headphones to monitor our levels, instrument ins to record some guitar, or perhaps MIDI to play keyboard. These instrument hook ups may not be in your radar, especially for podcasting, which is fine. However, these also act as “external sound cards” to digitally process our vocal sounds more efficiently than if you were to just plug a USB mic into a computer by itself. Software: Of course, “podcast software” is a very broad term, since there aren’t many programs out there completely dedicated to just “podcast things” (at least as of now). 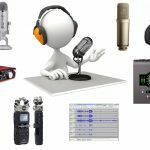 Our guide we just linked to can help, but many of the packages for podcasts we just compiled include some type of software so we can not only record our voices, but mix and finalize them after as well. 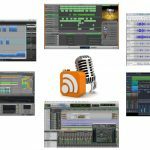 If the package for podcasting you’re eyeing doesn’t include software, you can always read our best podcast software or perhaps free music software guide to give you some options. Headphones: Since headphones come in so many different shapes and sizes, we’ll recommend one exact design that are best with podcasting — closed-back, dynamic and over-ear headphones. If you aren’t familiar with the terminology, it’s not a problem — just know that the headphones will have an ear cup that goes over your ear and disallows sound from leaking out into our microphones with the “closed” back. Any pair of “studio headphones” will ultimately will work, just as long as they are built with a closed-back design. 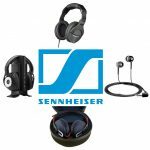 All of these packages below come with the feasible type of headphone that will work well. Cables: All of the podcast bundles in here will come with the necessary cables to hook up all of your gear, but if you’re buying any separate just make sure that you have the compatible cables depending on what device you need to hook up. We’ve had a few times happen where we purchased gear (such as speakers) and didn’t have the proper cables, only to have to order them and wait even longer to get to use. This includes XLR cables for mics, TRS or RCA cables for speakers, or USB cables for audio interfaces and mixers. Camera: This is listed last because it’s an optional part of podcasting in general. So our question is, do you plan on filming your podcasts as well? We know many who do so, while others won’t bother. We found one of the best podcast packages down below that includes a camera (the new MXL VRS Solo), while many others do not and you’ll have to buy a podcast camera separately (our vlogging cameras article may help). Up first we have one of our favorite picks as the best podcasting package with not only a mic, interface and headphones, but a modern, cross-platform DAW (“digital audio workstation”, another name for music software) as well with multi-use capabilities as it can function without hiccups as a 32-bit or 64-bit application. This application comes simplistic in design and when paired up with their popular AudioBox audio interface, is going to be sufficient for capturing the necessities for your podcast recordings. This is also one of the best podcast bundles on our list because the interface offers two combo mic/instrument inputs and zero latency monitoring so that you can waste no time and begin your recordings right after plugging it in. This bundle comes with one of the most popular features in a podcast bundle as it is equipped with an M7 large-diaphragm condenser microphone, very high quality for the price. It is a fan favorite among professional studio artists as it allows you to capture the minutia in your harmonics that would typically get filtered out in your typical dynamic mic, which will only help the quality of our podcast recordings. The PreSonus AudioBox 96 Studio is one of the best podcast bundles when using Mac or Windows computers, and we feel it covers literally every part of our checklist aside from perhaps a video camera. Simply put, the Podcastudio USB is the ideal way to turn your thoughts into words. This is professional grade podcasting bundle that comes with all of the necessary features to make high-quality podcasts, and produce your own music and home recordings. In addition, this is one of the best podcast bundles when using PC or Mac. The Podcastudio comes with a USB interface, mixer and headphones so that you have all that you need, so that you don’t have to shop for additional connecting features. Basically, you are going to have an easy time reaching high level frequencies and generating the ideal sound that you are looking for, all for a very affordable price. The gear isn’t necessarily as high-quality as the previous AudioBox Studio or perhaps a few others below, but if you wanted to save some money and get the basics for starting a podcast, this is your best bet. The Behringer Podcastudio allows you to become a podcaster right out of the box, as its high-resolution 2 in/2 out USB audio interface allows you to simply plug-and-play for Windows SP (or higher) and Mac OS X operating systems. Here we have a very high quality studio grade system that offers just about everything required to record your ideal sound. All of the necessary specs are offered in the Focusright iTrack studio in one budget-friendly package as it lands within the middle price-point of this guide. 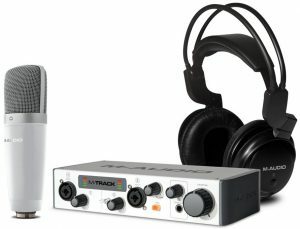 This podcast bundle offers 24bit/96KHz iTrack Solo 2×2 audio interface, in addition to a CM2S studio condenser mic. The iTrack Solo possesses a mic preamp, and Signal Halo LED’s for an enhanced sound and also conveniently includes all cables so you don’t have to go out and purchase additional necessities. Furthermore, you are going to also have USB connectivity, so you don’t have to worry about getting too technical with this bundle — it will work on Mac, PC or laptops of all types. If you are a beginner to recording, the Focusrite iTrack Studio is a great starter kit and one of the best podcast bundles in the market today if you wanted a step up from the Podcastudio. It also comes with the popular audio software Ableton Live Lite. 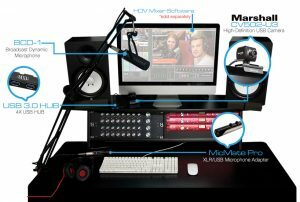 The MXL VRS Solo is very new for this year, a work of art and brings together a bundled package of high-quality material to make your live podcasting and web streams significantly easier to bring to life. We’d recommend this one if you’re serious about filming your stuff. The Solo bundle features a detail oriented broadcast microphone, in addition to a USB-powered high-definition POV camera that sits atop your screen. 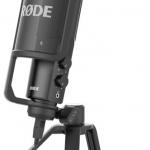 The podcast bundle also comes with a MXL Mic Mate Pro XLR-to-USB adapter, as well as a BCD-1 Mic stand, and an MXL USB hub for an even stronger delivery for enhanced audio quality. 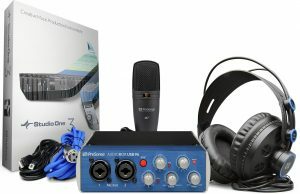 This bundle can be used for music production, web conferencing, podcasts, and just about anything else that you can think of that needs to be recorded. This is one of the best podcasting bundles for those of you looking to find a more profound sound, while still obtaining all of your required features in one purchase. The MXL VRS Solo does it all and combines well with a professional live stream software, this includes things such as HDV Mixer software however they unfortunately make you buy that separately. This is a great deal for those of you looking to take a cheaper alternative to taking your podcasting to the next level, especially if you want to film. This is a podcast bundle that is certainly top of its class, in particular price-point, and one of the best podcast bundles for its size and high-level capabilities. This particular package features a dual-channel audio/MIDI interface so that you can hook up your mic and obtain an ideal 24-bit audio sound. Simply plug and play so that you can listen and record on the go. This bundle also features 2 channels with XLR/TRS combo audio jacks with phantom power, so if you’re recording more than one individual for your podcast, you can do so at the same time. The iRig Mic Studio XLR mic is a large diaphragm analog condenser microphone that offers a great compliment for great quality vocal recording. 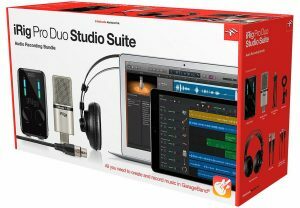 If you are looking for a great deal for your podcast or musical recordings, the iRig Pro Duo Studio Suite could be a great fit for you if it’s within your budget. The Scarlett 2i2 Studio is a podcast package that will bring your recordings to life with crystal clear sound quality. The true beauty about this recording device, is its ability to cancel out background sounds, and enable the podcaster or music recorder to capture the clarity of the sound that they are looking for. The Scarlett 2i2 interfaces come with lower latency than many others that is USB audio related on the market. 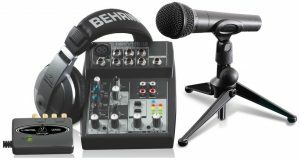 This is one of the best podcast bundles for either beginners or more advanced users out there as it spans across a broad range, especially since you can hook up two mics at once here with 2 channels. To sum up, the Focusrite Scarlett 2i2 Studio is a crystal-clear podcasting bundle that will take your recordings to another level, and just might allow you to learn something new. Last but not least, this package deal is the real deal, as you are now able to complete your computer based recordings with high-performance features and hardware that make your life a lot easier. With this package, you can simply plug your microphone into this interface and subsequently connect the interface to your home or studio computer. Additionally, this software offers two different selections: the Ableton Live Lite as well as a collection of Waves plugins (better for music, but you can add FX to your podcasts if you’d like). When you combine the two you will see why this is one of the best podcasting bundles being sold today, especially with the inclusion of their high-quality closed-back headphones and large-diaphragm microphone. Enhance your studio sound, and let the M-Audio Vocal Studio Pro II handle all of the grunt work for you to top off our best podcast packages guide with a bang.